Over a decade ago CPI engineers looked at the increasing need for robust hydraulic cylinder position sensing in heavy duty construction vehicles, long stroke hydraulic cylinders and hydraulic accumulators. These deployments were exposed to high vibration, high heat environments, or even immersed in salt water as in subsea mining or drilling applications. We quickly came to the realization that there was no linear position sensor technology specifically designed for these applications, or in fact any heavy duty hydraulic equipment in an extreme duty environment. Designers were mostly trying to use magnetostrictive “rod-type” sensor technology in these long stroke hydraulics, because it was the prevailing sensor technology for many applications and it is well known to most hydraulics manufacturers This technology can be highly accurate and robust in many applications but for long stroke and telescoping hydraulics despite being a sub-optimal solution, it was often the only game in town. 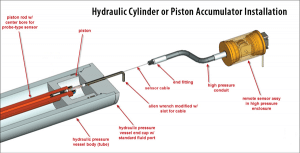 What hydraulic cylinder manufacturers found is that in these long stroke environments, rod-type sensors exhibit certain failure modes that can shorten their life cycle and make them more expensive and difficult to maintain. 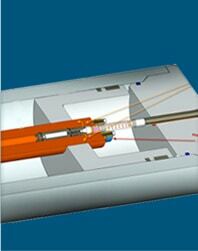 Manufacturing for rod-type sensors requires a precise center bore be drilled into the cylinder. 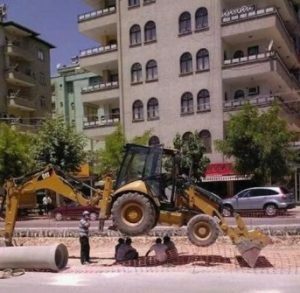 The longer the hydraulic stroke the longer the magnetostrictive rod (waveguide) and the more difficult this operation. The combination of heat and vibration can cause the waveguide to “sag” over time at which point it becomes inaccurate and is ultimately pounded into a corkscrew by the action of the piston. Replacement of failed sensors requires the exact same rod size be available as that of the sensor being removed. Field disassembly and removal of the failed sensor is non-trivial to say the least, especially if the sensor is sub-sea, or ocean based. Operating Temperature ranges of Magnetostrictive sensors are limited and when a rod is very long (> 1 meter), a high temperature envitonment can contribute to mechanical failure in environments of hot and continuous use. Rod type sensors are unable to handle telescoping hydraulic cylinders due to the fixed rod length. Rod sensors are not realistic for “out of cylinder” deployments. What if you could simply replace a Rod-Type sensor in virtually any cylinder with little or no modification? CPI has developed an entire line of Linear Position Sensors meant to be a drop-in replacement for all kinds and sizes of rod-type sensors but especially those used in long stroke, harsh duty environments. On the front end, our sensor screws into the end of the cylinder bore left empty by the removal of the failed sensor. 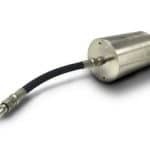 And on the back end, our LVDT based, non-contacting sensor provides the same absolute cylinder position measurements as before through exactly the same electrical interface as before, meaning no updates to your control system or software are required. Our signal conditioner can provide standard voltages as well as custom voltages and even PWM signals as required. Watch the video below to see just how easy it is to install our SL0390 in an existing cylinder. CPI’s Sensor replacement series come in both standard and custom configurations driven by the stroke length, and environment specific to your application. See below for standard product operational descriptions. 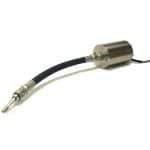 By using a proven draw wire sensor design that has been completely re-engineered for reliability and performance from the ground up, CPI removes the difficulties of using a rod-type sensor in long stroke applications where longevity is of paramount concern. No piston drilling required. We fit in the hole left behind by the rod. No Rod (waveguide). Inherently immune to vibration and angle of deployment. One sensor can replace in cylinders of many different stroke lengths because it’s a spooling stainless steel cable, not a fixed rod. Simpler electronics. Our Sealed LVDT can be completely immersed in hydraulic fluid or seawater. Simpler measurement technology means less failures. Non-contacting LVDT based position measurement and simpler electronics mean almost 2X the temperature range (250F standard) of standard magnetostrictive sensors. No cooling systems are required. Sensor is completely submersible, there are no closed pressure vessels in our design and we have been tested in as much as 5000ft of seawater. We can be deployed on the oil or the gas side of the cylinder in as much as 5000psi of pressure. 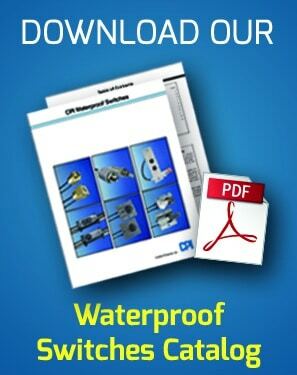 For more information please Contact Our Engineering Sales Team at (973) 887-9400.